The tools of Six Sigma are most often applied within a simple performance improvement model known as Define-Measure-Analyze-Improve-Control, or DMAIC. DMAIC is summarized in Table 1. 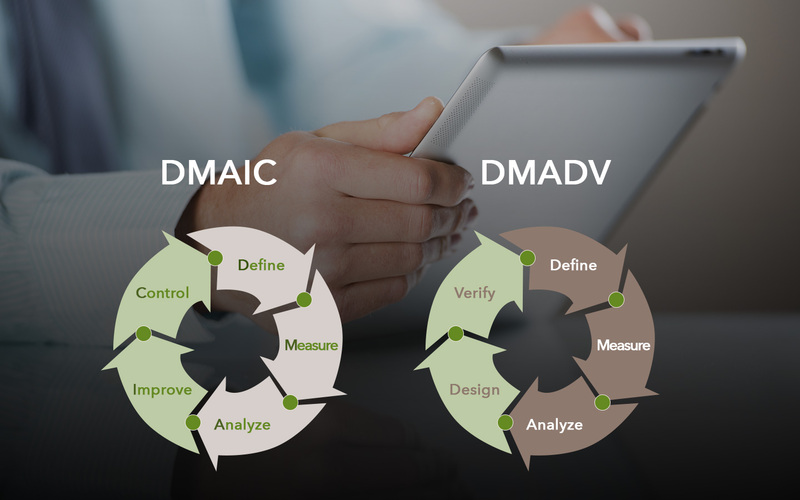 DMAIC is used when a project’s goal can be accomplished by improving an existing product, process, or service. Define the goals of the improvement activity. The most important goals are obtained from customers. At the top level the goals will be the strategic objectives of the organization, such as greater customer loyalty, a higher ROI or increased market share, or greater employee satisfaction. At the operations level, a goal might be to increase the throughput of a production department. At the project level goals might be to reduce the defect level and increase throughput for a particular process. Obtain goals from direct communication with customers, shareholders, and employees. Measure the existing system. Establish valid and reliable metrics to help monitor progress towards the goal(s) defined at the previous step. Begin by determining the current baseline. Use exploratory and descriptive data analysis to help you understand the data. Analyze the system to identify ways to eliminate the gap between the current performance of the system or process and the desired goal. Use statistical tools to guide the analysis. Improve the system. Be creative in finding new ways to do things better, cheaper, or faster. Use project management and other planning and management tools to implement the new approach. Use statistical methods to validate the improvement. Control the new system. Institutionalize the improved system by modifying compensation and incentive systems, policies, procedures, MRP, budgets, operating instructions and other management systems. You may wish to utilize standardization such as ISO 9000 to assure that documentation is correct. Use statistical tools to monitor stability of the new systems. Another approach, used when the goal is the development of a new or radically redesigned product, process or service, is Define-Measure-Analyze-Design-Verify, or DMADV. 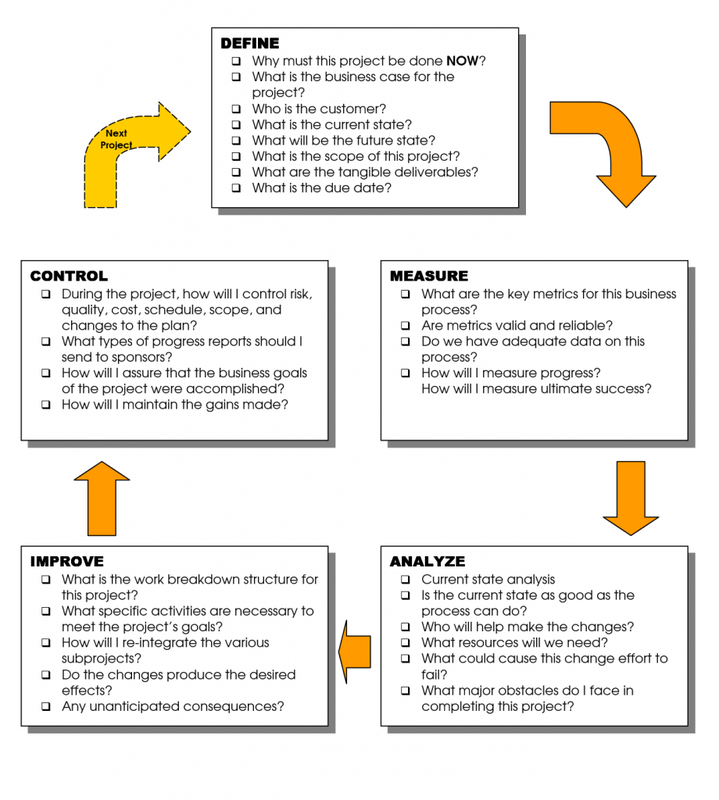 DMADV is part of the design for Six Sigma (DFSS) toolkit. Define the goals of the design activity. What is being designed? Why? Use QFD or Analytic Hierarchical Process to assure that the goals are consistent with customer demands and enterprise strategy. Measure. Determine Critical to Stakeholder metrics. Translate customer requirements into project goals. Analyze the options available for meeting the goals. Determine the performance of similar best-in-class designs. Design the new product, service or process. Use predictive models, simulation, prototypes, pilot runs, etc. to validate the design concept’s effectiveness in meeting goals. Verify the design’s effectiveness in the real-world. 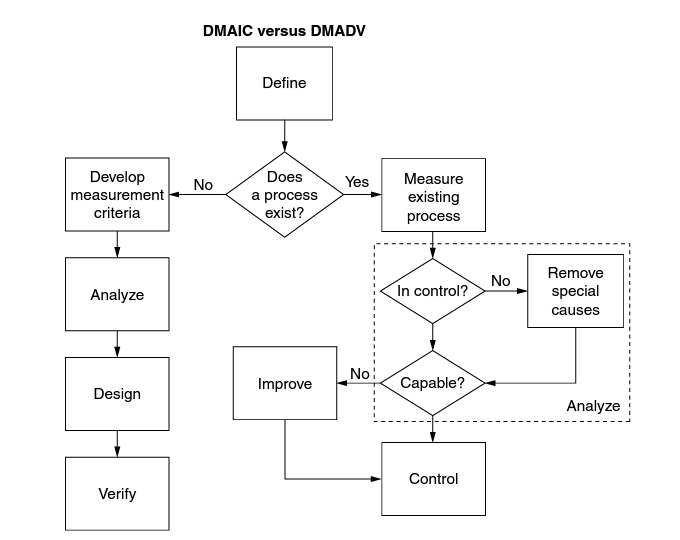 Figure 2 illustrates the relationship between DMAIC and DMADV. If you have more questions regarding DMAIC, DMADV, or Six Sigma training in general, contact Pyzdek Institute today! Reproduction allowed if no changes are made to content and you link to www.pyzdekinstitute.com from your site.